Nicheworks are highly coveted or soon will be as no brand is an island. Attention and interests are focused within social streams and as individuals are empowered to define their online experiences, connecting the dots proves pivotal. If conversations are markets, nicheworks represent the glue that binds disparate conversational ecosystems. And through effective engagement, we make inroads towards community and being the construction of bridges between our brand and each desirable market. While many creative initiatives find their way into social networks extemporaneously, it is the intentional and manual act of linking content to new and traditional influencers. This, for the moment, is the most genuine and authentic way to demonstrate intent and drive awareness and activity among the very people we’re hoping to reach and galvanize directly within the communities where their attention is focused. Hybrid Theory is the fusion of creative and communications, combining earned and paid media to enliven ideas, unite communities, amplify stories and spark desired outcomes. It unites marketing, advertising, service, and public relations (note: not PR) with engagement and digital influence. This is about applying influence to rouse response where attention is focused. As such, Hybrid Theory requires a cross-breed of communications professional, one not tainted by the acts of storytelling through press releases or communicating through mass messaging and broadcasting. This new breed of communications professional essentially becomes the influencer they wish to engage through the embodiment of what I call the “5I’s,”an evolution of the 3I’s introduced by Forrester Research in its Future of Agencies Report. The 5I’s are rooted in peer-to-peer networking where the individuals with whom they connect are viewed as equals and conversely, those making contact are qualified as worthy of attention. In a conversation several years ago with Doc Searls, Chris Heuer, Robert Scoble, among others, Searls described social media as the “live web.” It’s a name that resonated and is now a fully-realized prophesy. Indeed, this live web has evolved into a hyperactive conversation ecosystem that encourages and rewards real-time content creation, collection, and distribution. 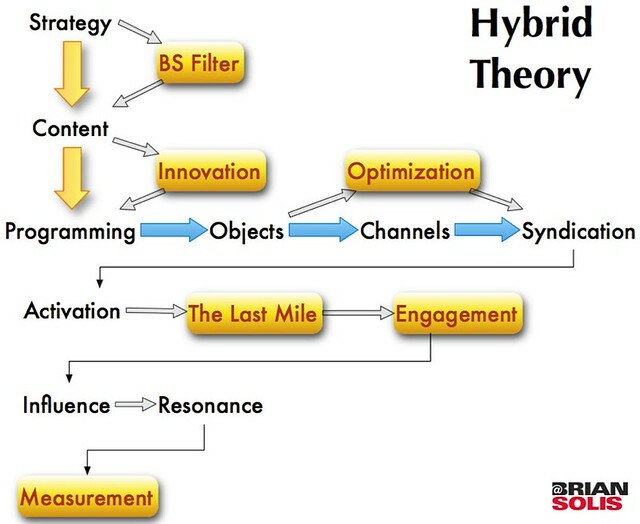 As social consumers, we willfully drink from the firehose and as such, Hybrid Theory introduces the strategies and means necessary to not only compete for the moment, but also inspire a more vested form of participation that fosters presence and affinity. If we were to visualize the 5I’s into a workflow for Hybrid Theory, everything would begin with intelligence and the data necessary to inspire insight, innovation, and a corresponding action plan that officially brings creative to life. It is during this process that influential voices who reach and influence other individuals within our desired markets surface. Ideas are then tested against an influence filter to gauge the viability of meaningful vs. promotional engagement. As such, channel diversity is then explored to chart effective courses for direct connections and the social objects commensurate with conversations within each. Concepts are then transformed into campaigns, stories are packaged as social objects and highly personalized social hubs are constructed to host, define and steer the user experience. As the campaign goes live in its respective mediums, the hybrid team is then tasked with optimizing contentfor search in traditional search engines and also social networks. This form of inbound marketing, speaks for the program when consumers seek out related content outside of proactive outreach. Once optimized, social objects are then syndicated through all channels previously identified to reach our audiences and prospective participants as they search for relevant content. But, it is the last mile where our connections with influential people brings our campaigns to life. This is where we connect the brand, its persona, its mission and purpose, and extend value to our consumers and the markets they represent. It is how we engage and with whom that defines the reach, velocity, and ultimately the resonance of our campaign. And, it is our participation that either credits or debits our social capital. The state of brands in social networks is measured by the multiple axes of resonance and fortified by the relationships we earn and the actions we merit. Hybrid Theory introduces a human framework that marries best-in-class attributes of data analysis, sociology, advertising, marketing, communications, and service to connect people and brands through relevance, empathy, and empowerment. Without relevance, we cannot trigger resonance, and without resonance, we cannot establish significance in social media.